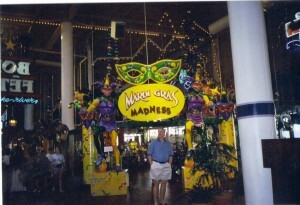 I had been to attend the SNM conference at New Orleans. For those perverted minds who put SNM and New Orleans together and get 5, let me quickly add that it stands for Society of Nuclear Medicine! New Orleans looked different even from the air while the plane was landing…I could see several shades of green: the grassy green of the freshly mowed lawns, the dark green of trees grouped together almost like a small forest and pale “coconut chutney” green of the swamps! New Orleans is mixing pot of several cultures. It was a French settlement initially, then came into Spanish rule for about 40 years and then eventually became a part of the United States in December 1803. It was also enriched by the migration of the French Acadians from the present Nova Scotia in Canada Louisiana in the late 1700s. 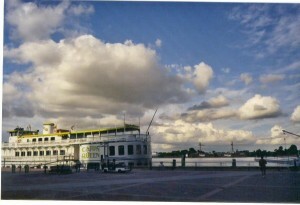 Each of these cultures left an imprint in New Orleans, like the practice of voodoo which was a legacy from the Spaniards and the delicious blend of Cajun and Creole food from the French Canadians and the local French-Spaniards and of course the Mardi Gras which was a local French festival and now heavily commercialized into a wild romp by the present Americans. For New Orleans is well known for its cuisine and not only does it live up to its reputation but surpasses it. Beignets, Jambalayas, Gumbos, pecan pralines and a multitude of sea food!! The food has spice and taste and has a distinct taste different from the normal “American Food”. Due to its geographical proximity to the Mississippi river and the Gulf of Mexico, sea-food was predominant. Even a chicken sub (called Po-boy by the locals) had a large quantity of shrimp in it. Definitely a paradise for both the gourmand and the gourmet. Actually, I read this joke before embarking on a swamp tour; it said when you visit an animal habitat elsewhere signboards provide you with the local name, scientific name and some characteristic facts about the animal. In Cajun land you get the local name, the scientific name and a recipe!!! Thought it was a good joke before starting on the tour at the Bayou Segnette (Bayou =Indian word meaning slow moving river) to see alligators and raccoons amongst the swamps but when our tour guide offered no less than 3 recipes for alligator meat I was forced to admit it was not just a joke. 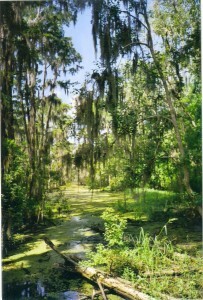 Cypress trees surrounded the swamps and alligators abounded in them. We also caught sight of some raccoons and some snowy egrets and heard some history of the swamps and shrimp fishing. The Louisiana swamp region supplies about a third of the country’s seafood and cooking and eating were the standard topics of his spiel. And of course no description of New Orleans can be complete without a mention of Bourbon Street. The French quarter had a characteristic construction of buildings with long balconies rather like apna chawls. The street is filled with bars and restaurants most of them playing live music (jazz is the speciality here) and very very crowded. The street was so crowded on a Tuesday night at 10 pm that I could not imaging the weekend crowd and especially the crowd during Mardi Gras! There were some crazy people flinging beads from these balconies and there were people below to scramble for the beads in a half drunk state. But inspite of that the joie de vivre of the place was infectious! If you want to see the whole album please click here . It is in image station and you might need to sign up for an account to see it. It is a free account and I really recommend it ! Pakeezah and Junglee : Caught it on Turner Classic Movies Thursday night! I got my H1 visa approved yesterday! Despite the rumors of indefinite delays in getting approved, and the scares of my application being rejected, I got my approval within 3 months. That saves me a major headache and it saves my employer an additional 1000$ for the visa expedition process. Right on cue, INS made some more “Important Changes Affecting the Immigration Procedures for Foreign Nationals”. This includes personal interviews before stamping your passport and delays in obtaining an appointment for an interview and also delays due to the increased time required to issue a visa. I am heaving a big sigh of relief at passing one stage of this ordeal. The visa procedures have become more and more convoluted and obscure each day. Most of them don’t make any sense anyway. Now every student on F1 or J1 is supposed to register in SEVIS, which keeps track of the individual’s movement anywhere within the US. New rules even include fingerprinting visitors!! I think soon there will be a day when all non-US people will be forced to wear a sign or carry an ID! Golden Gate by Vikram Seth. A whole book in rhyming sonnets!! …and the book has a story one can relate to as well. Its easy to go off tangent when you write in verse but for most part Vikram Seth keeps to the story line. Must read ,IMO. Bhoot : If you really want to be scared skip this one. The only moment I was scared in this movie was when I entered an almost empty cinema hall . Excellent performances, some great camerawork, a few good red herrings but overall disappointing. I don’t know what I was expecting but I was expecting something more …. TopWrite Corner : Featuring budding authors from all over the world. My second visit to the waterfalls of Niagara. Words are not enough to express the majestic beauty of the Niagara and the sheer power of the water roaring over the edge. Therefore, here are some photographs…. . sometimes pictures do say it better than words. Niagara is not the world’s largest or biggest waterfall. It does not have the largest volume of water and neither is it the world’s widest waterfall. But for it’s height and volume, it is possibly the most accessible waterfall. Niagara Falls is located on the Niagara River in eastern North America, on the border between the United States and Canada. The name refers to three separate waterfalls: the American Falls, the Bridal Veil Falls, and the Horseshoe Falls (known in Canada as the Canadian Falls). While not exceptionally high, Niagara Falls is very wide, and a large volume of water passes over it. The scenic view attracts millions of visitors, especially in the summertime. 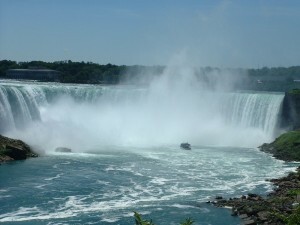 Niagara is not the world’s largest or biggest waterfall. It does not have the largest volume of water and neither is it the world’s widest waterfall. But for it’s height and volume, it is possibly the most accessible waterfall. There are several ways to expereince the falls by getting very close to it, other than going over in a barrel , ofcourse! The Maid of the Mist provides a boat service that gets you quite close to the base of the Horseshoe falls, the Cave of the winds tour allows you to walk quite close to the base of the Bridal Veil falls and have the water plunge just a few meters away from you. Then there was the balloon ride we took we gave us an aerial view of the entire area surrounding it and we could see the Niagara river flowing placidly ,becoming tumultous as it reached the gorge and then plunging deep down with a deafening noise! 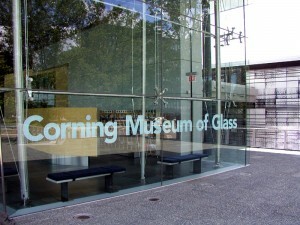 On our way back we stopped at the Corning Glass Museum , yes of the Corning ware fame. Situated in a beautiful place called Corning , it had an interesting museum which served as a showcase for the history of glass, beautiful glass sculptures and a live demonstration of glass making! 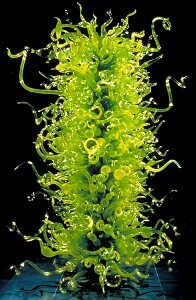 And they even glass market where you got excellent glassware at a very reasonable cost.